Old pickup trucks are being restored across North America. There has always been a cadre of vintage truck enthusiasts who love their stove bolt six engines or dote on the old Dodge in the shed. The last six years has witnessed an exponential growth in truck restoration. Parts supplies have never been easier now that big vendors have moved into the marketplace. We're following the restoration of a survivor truck from the plains of Manitoba. It's a 1961 Chevrolet Apache half ton that has been in the same family for generations. The owner decided it was time to bring the truck back to her former 'as delivered' glory. Towards that end, Floyd and Ryan Nelson are performing the tear down, body work, sanding and paint re spray. 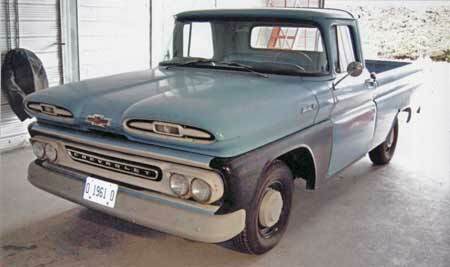 Chevrolet redesigned their half ton pickup series in 1960 in order to better serve the light truck buyer. 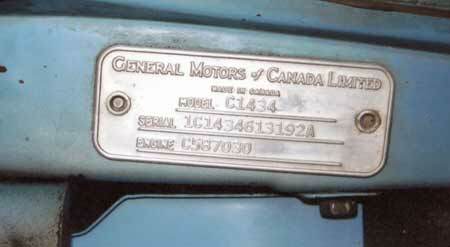 Although the V8 engine was available since 1955, General Motors always considered Chevrolet to be the light duty truck division and the use of a V8 was believed to be more suitable for the heavy duty GMC division. Major changes appeared under the skin starting with a new, drop center X type frame. This was required because Chevrolet switched to independent four wheel suspension that year by using coil springs out back and torsion bars up front. That demanded a stiffer frame. Another change was a lowered cab and different bench seat to floor dimension which brought the truck lower to the ground. That made ingress and egress easier and lowered the center of gravity for better road holding. Although the windows looked similar to the 1959, none of the windshield or side glass interchanges. The windshield was taller and wider and the vent panes were smaller. 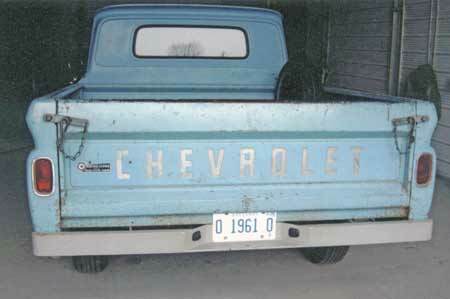 The model identification system was updated to the one most Chevy fans are familiar with today. The half ton pickup starts with the letter 'C" to indicate conventional cab, '1' to indicate half ton series, '4' for the 61/2 foot long body and the last two numbers indicated either step side or fleet side boxes; 404 or 434 respectively. The cowl tag is riveted on the driver side windshield post. It describes the truck configuration and lists engine serial number which often was used as registration in some States. Our truck is a Canadian made model and shares the same identification system as evidenced by the tag riveted on the driver side A pillar. It is a half ton conventional cab, six and a half foot body with the fleet side box. 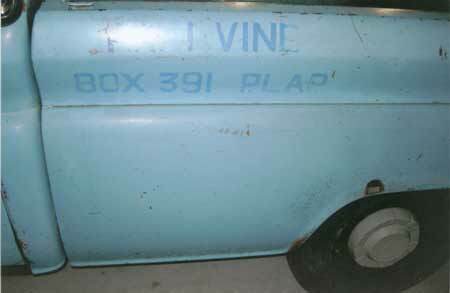 The truck is finished in Brigade Blue and you can see the original intensity of this paint finish under removed trim such as the mirror brackets and nameplates. Only two panels were replaced prior to the start of the tear down and restoration. The driver side front fender and rocker panel have been replaced with GM pieces. The rocker panel still has the dealer parts shipping tag on it. The fender is still unpainted with factory black matte finish. There are a number of interesting details worth documenting in an unmolested vehicle. This truck gives us an opportunity to observe how they came from the factory back in 1961. Let's start by looking at the front end. The turn signals are inside the two hood vents in the center of a large cross shaped ornament. The ornaments and headlamp pods below are painted a complimentary color to the body with a low gloss finish. Many amateurs repaint the grille and ornaments in a high gloss finish which looks nice, but isn't correct. You can obtain the correct paint codes and ratio for mixing the proper gloss from a shop manual or any good automotive paint supply shop that lists these colors in their files. You'll notice that the interior paints are often low gloss or matte as well. These are also listed in body shop manuals. Its details like these that make a restoration stand out. Another interesting detail is how tight and consistent the hood to cowl panel gaps are. Even the lower turn signal panel that bolts to the hood is exact. This 1961 Apache has been in the family for generations and still wears its faded Brigade Blue paint. Front fender is a GM replacement that hasn't been primed yet. 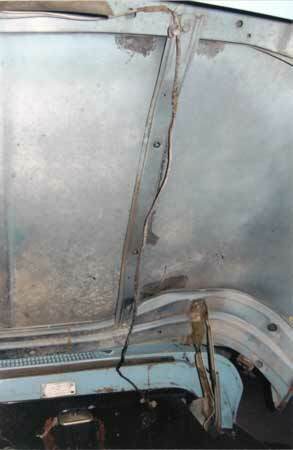 In this close up of the driver side door, you can see the factory placement of the outside mirror and the original traces of blue that is well preserved where the rubber gasket made contact with sheet metal. You'd think the vast area of metal under the mirror base casting would be ideal to get a color sample but it has faded as well due to air and moisture. Only the rubber coated area saved the paint best. Close up detail shows location of mirror and trim pieces. Notice that the paint is best preserved where rubber gaskets covered the metal, preventing air and sunlight exposure. Moving along the driver side of the pickup box, we see the remnants of the working farm and its mailing address. We also see a common rust out area on these boxes. The rear wheel wells frequently break out near the top of the lip just before dead center. Looking outside, there doesn't appear to be any logical cause for this rust. The cause is on the inside of the box, hidden from view. There is a structural brace diagonally mounted which prevents the rear fender from vibrating over rough roads and developing sheet metal creases and tears. That brace collects debris over time and rots out. This section will be revealed and repaired as part of the restoration. On the fleet side box there is a common rust out area just above the wheel well crease. The cause of this rust is on the other side of fender due to a brace. Unrestored original trucks are ideal sources to make notes on how the factory assembled and finished parts including details you'd never think of when tearing down the vehicle for restoring. If you didn't take pictures or make notes, it'd be easy to reassemble something that works well but isn't factory correct. Let's look at the wiring harness for the turn signal housings. In the Apache, the housings are faired inside two slots at the end of the hood. The wiring comes from the main harness at the firewall and follows the main hood brace until it reaches the front. Then a clip holds it in place and the wiring turns to the passenger side just behind the hood seal towards the housing. It isn't a tidy installation but it worked and it's original. Amateur restorers often make wiring or equipment installations too tidy and clean. These weren't show pieces. They were tools for work. The underside of the Apache hood shows location and presentation of turn signal wiring loom. Notice how loose and casual the loom and clip placement is. It's slack to allow flexibility for rough road travel without disconnecting from housings. Moving towards the rear, we can see more details to guide the restorer. Many trucks have had their tailgates changed, customized or removed. This one retains its original tailgate locking hardware. The rear bumper is a later addition. 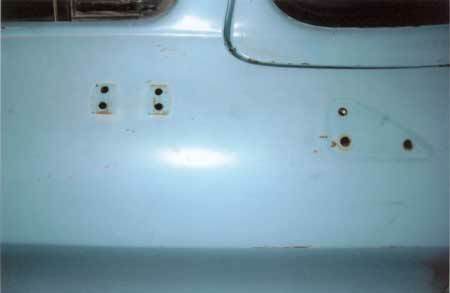 The original tail gate latch hardware is intact with tailgate. The rear bumper is a later addition. The box floor is made of wood with steel straps to hold them down. Unlike many trucks, this one has the original straps and is reputed to have the original bed floor, but is likely on its second set of wood panels. 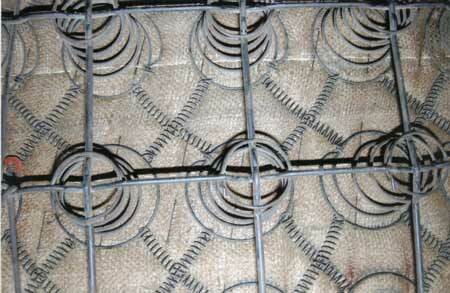 A lot of owners welded in checker plate or some form of steel flooring after the original wood split and dried out. To see one with original straps, wheel wells and actual wood after all these years is unusual. This makes an excellent base to obtain correct wooden slats. 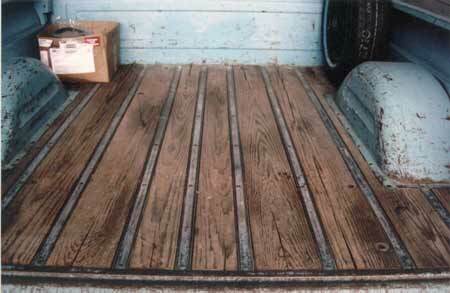 The pickup bed straps are original and the wood slats are reputed to be factory. It's rare to see this part of the truck still original. The interior of trucks are frequently modified to suit owner's tastes and work conditions. This Apache is unusual in that it is almost untouched. The dash, steering wheel and instrumentation are the same ones that left the factory. There is no radio installed anywhere. Even the satin paint finish on the dash is original. Notice the multiple cracks developing around the rim of the steering wheel. This was a common problem with early plastic coated metal frame steering wheels until manufacturers switched to softer vinyl based material later on. This wheel can be restored using two part epoxy to fill in the gaps, sanding and painting. 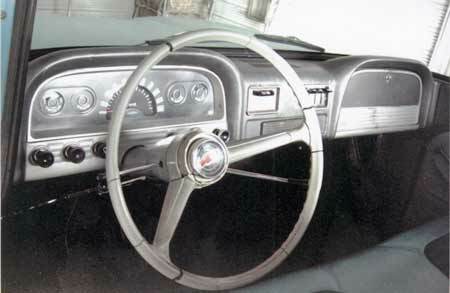 The dashboard and steering wheel shows the satin finish of interior paint. The cracked steering wheel is a common flaw and is easily repaired using epoxy filler and sanding. One notable change from original is the bench seat material. Somewhere along the way it gained a green vinyl seat with pleated cloth inserts. The back of the seat reveals the original coil springs, burlap and red plastic tag which would've held the cardboard trim tag number code. It is no longer present but replacement bench seat material is available in the correct color. Seats were often reupholstered if not changed out over the years. The back of the bench seat reveals factory coil spring and diagonal wire supports, burlap covering and the red trim tag rivet. The actual cardboard tag is gone. The goal of the owner is to return the truck to its former glory with factory blue paint, restored bed and general tidying up underneath. Some repairs will be made to certain structural braces that contributed to rust and we'll look at these details in our next installment.